TMS Spell Check engine: performs spell check & auto-correct either while typing in the TAdvMemo. TAdvMultiFileMemo: manages editing of multiple files simultaneously and presents these multiple files via a page control. TAdvMemoEditToolBar, TAdvMemoEditingToolBar : preconfigured toolbars to use together with a TAdvDockPanel. The preconfigured toolbars can be used for file open/save handling, clipboard handling and find & replace. 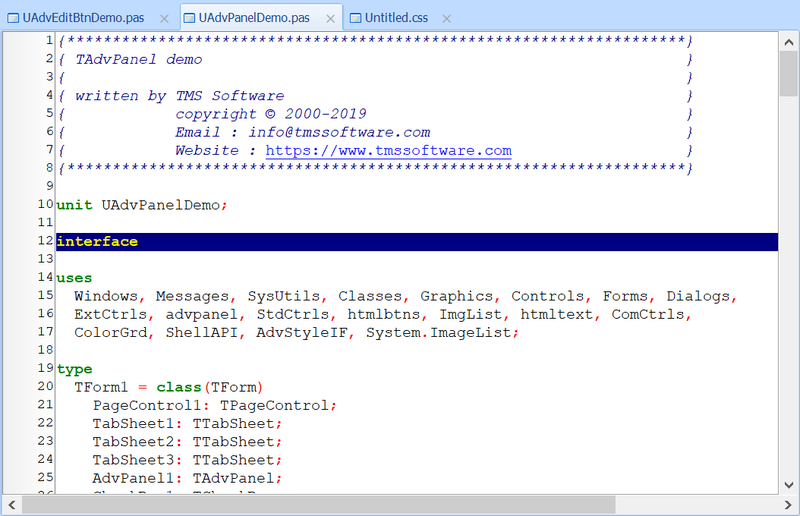 The toolbars use TAdvMemo actions. 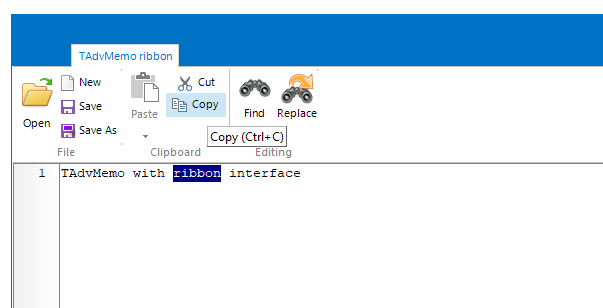 TAdvMemoClipboardRibbonToolBar, TAdvMemoEditingRibbonToolBar, TAdvMemoFileRibbonToolBar : preconfigured toolbars for use on a ribbon (TAdvToolBarPager) with a toolbar for TAdvMemo file handling, TAdvMemo clipboard handling and TAdvMemo find & replace. Demo1 Demo showing the various configuration possibilities of TAdvMemo. Demo2 Demo showing the AutoCorrection functionality in TAdvMemo. Demo3 Demo showing the auto completion functionality and the Drag&Drop between TAdvCodelist and TAdvMemo. 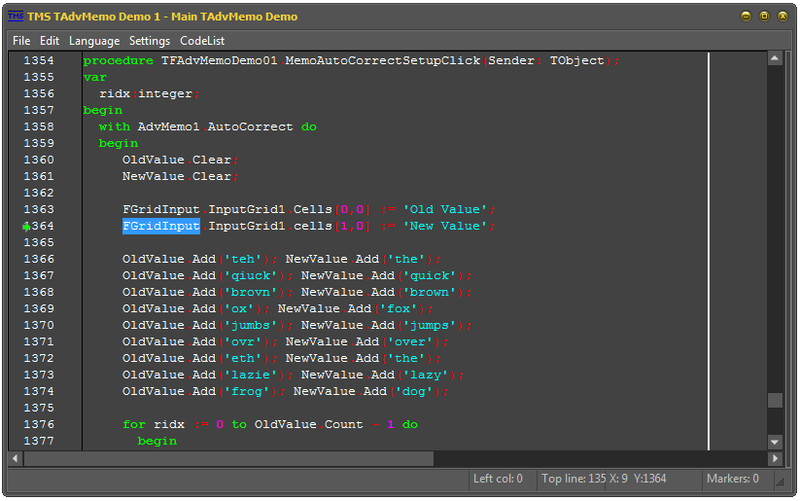 Demo4 Demo showing how to use regions for code-folding in TAdvMemo. 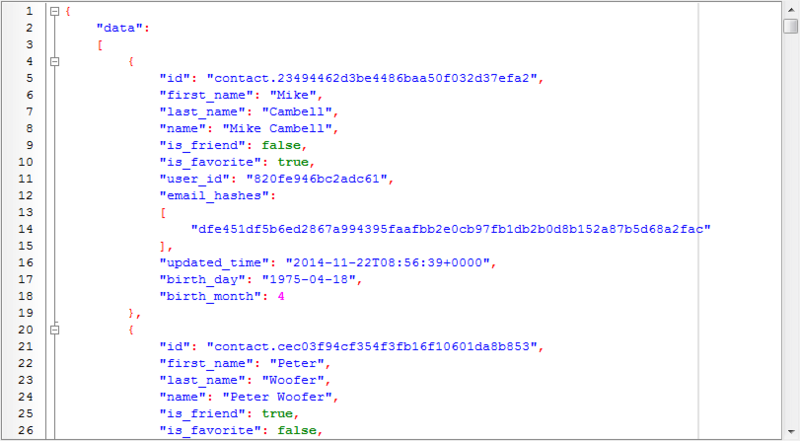 Demo5 Demo showing how to use the OnGetAutoCompletion event to integrate the auto completion with real object interfaces: properties, events, methods. Demo6 Demo showing how to use TAdvEmoticonMemoStyler to show emoticons along in a text file. 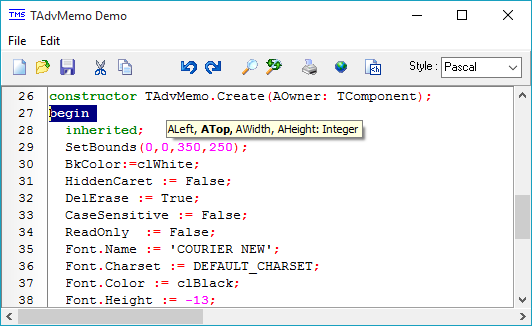 Demo7 Demo showing how to use TAdvMemoSource together with TAdvMemo to create a multi file editor with a single TAdvMemo. Demo9 Demo showing how the Addict spell checker is called as words are typed in the TAdvMemo and automatic spell check / spell correction can happen while typing or when invoked. Demo10 Demo showing how TMS SpellCheck is used as spell checker for TAdvMemo.